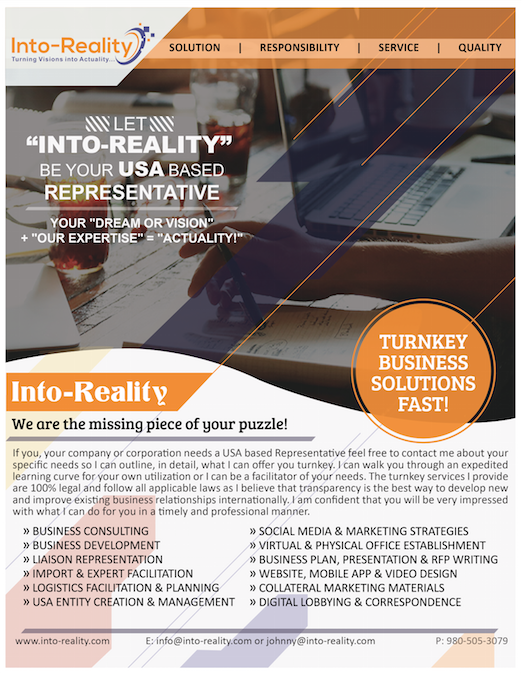 Let Into-Reality be your USA based Representative! Into-Reality can represent any foreign company here in the United States of America to expand their business, project, venture or brand. Our expertise can save you a lot of time and money as we help you navigate the options for you to expand your operations into the USA marketplace. We can also complete onsite evaluations and assist in logistical mapping in other countries. Contact us today to learn more about these services and you will be glad you did!